The Basin is almost all forested with a central area of low mixed species (through which the Snowy River flows) and large areas of tall mixed species forest in the north-eastern section (Bendoc, Bonang and Deddick River catchments). In the far northwest there is an area of very tall Ash forest and Alpine/Sub Alpine vegetation in the headwaters of the Buchan River. The only cleared farmland is along the main highway north (Buchan/ Gelantipy Road), at Orbost, and around Bendoc and Delegate townships. The Snowy River flows from sedimentary, elevated tablelands near the NSW Border, then through areas of granitic, mountainous, dissected uplands to Orbost. The headwaters of the Buchan River rise in a high rainfall area (1,000-1,400 mm mean annual) but most of the Basin has an annual rainfall of 700-1,000 mm and only 600-700 mm in the upper reaches of the Snowy and Deddick Rivers. Flow in the Snowy River is controlled by water released from NSW reservoirs. The upper reaches within Victoria have been degraded by low flows but inflow from tributaries further downstream have maintained reasonable instream conditions in the middle and lower reaches of the Snowy River within Victoria. There has been sedimentation in the top of the estuary resulting from a reduction in the high flows which used to carry sediments out to sea. Greater environmental flow releases have recently commenced with the objective of eventually restoring flow to 28% of the natural mean annual flow. There is also a proposal to restore original instream habitat, including deep pools. Much of the Basin is located in National Parks. Although access to the Snowy River valley is difficult, the pristine condition of the area makes such visits very worthwhile. Some waters in this Basin are commercially fished for eels. (Large Fish): Australian bass, Australian grayling, estuary perch, Gippsland spiny crayfish, river blackfish, long-finned eel, short-finned eel. (Small Fish): Alpine spiny crayfish, Australian smelt, climbing galaxias, common galaxias, congoli, East Gippsland spiny crayfish, flathead gudgeon, mountain galaxias, pouch lamprey, shorthead lamprey, trout galaxias and southern pigmy perch. Brown trout, goldfish, rainbow trout and redfin. The most widely distributed fish, occurring in most waters, are brown trout, eels, then Australian smelt and congoli, The most abundant species in order are Australian smelt, brown trout, short-finned eels, common galaxias, and river blackfish. One important feature of the fish populations is the good resident population of Australian grayling in the Snowy River. Good numbers of spawning Australian grayling have also been located in the Deddick and Suggan Buggan Rivers. The East Gippsland spiny crayfish is restricted to the upper Suggan Buggan area (Berrima R), and the alpine spiny crayfish has been located in the Rodger River. Victorian Fisheries Authority has recently (2009) started to develop an East Gippsland Fishery Management Plan. This new plan will provide for sustainable management of recreational fisheries in the rivers, lakes and impoundments located within the boundaries of the East Gippsland Catchment Management Authority for at least the next five years. This plan is expected to be completed in 2010. Fish Stocking (stocking of desirable species is based on an approved Victorian Fisheries Authority stocking policy and is reviewed annually via Vic Fish Stock). No waters in this basin are currently stocked. Family Fishing Lakes Program (an ongoing project of stocking small waters within urban areas with larger trout, for junior and disabled anglers- see Introduction for further information). None are established in this Basin. Trout - Bendoc, Bonang, Delegate, Ingeegoodbee and Queensborough rivers and tributaries. Deddick River upstream of Tubbut. Buchan River upstream of Frying Pan Creek. Mixed - Suggan Buggan River tributaries upstream of Suggan Buggan, Brodribb River upstream of Rocky River Road, Little River. Wombargo, Goodwin, Jamb, Amboyne, Tingaringy and Wulgulmerang creeks. Snowy River upstream of Suggan Buggan River junction. Native - Suggan Buggan River, Rodger, Yalmy, Rocky, Jack and lower Brodribb rivers and tributaries. Cabbage Tree, Boundary, Butchers, Currie, Mountain and Hospital creeks. Buchan River downstream of Frying Pan Creek and Snowy River downstream of Suggan Buggan. 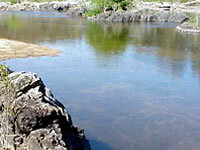 - responsible for catchment management and the River Health Program. River Health Program, (an on-going State Government initiative to achieve healthy rivers, streams and floodplains.) Major activities are willow control, and re-vegetation and protection of banks. Work has been carried out in the Brodribb, Buchan, Murrindal and Snowy Rivers. Snowy River Rehabilitation. This program involves; provision of increased environmental flows; protection and restoration of riparian habitat by removal of willows and weeds, planting native vegetation and fencing out stock; and trials to restore in-stream habitat such as deeper water and snags. It also involves re-establishing Australian Bass in the Snowy River. Although this program involves a number of State, Commonwealth and community bodies, including a contribution from the RFL Trust Fund, the catchment authority is the principal agency for on-ground works. Stream Flow Management Plans (an ongoing project in which various agencies and water user's develop a flow sharing arrangement which ensures an adequate environmental flow allocation for each river in Victoria). No stream flow management plans have yet been developed for waters in this Basin. The complete length of the Snowy River within Victoria has been listed as a Heritage River Area together with the Suggan Buggan River and lower Berrima Rivers and the upper reaches of the Buchan River (Playgrounds to Campbell Creek). The Buchan River (above Mellick Creek) has been listed as a Representative River of East Victorian dissected uplands. Gattamurh Creek, Wallaby Creek, Mount Gelantipy Creek, Musk Creek, headwaters of the Brodribb River, Rodger River and Mountain Creek. The Australian grayling and the alpine spiny crayfish are listed as threatened species in Victoria. (Department of Sustainability and Environment [DSE] Dec. 2007). A list of Victorian threatened species together with scientific names of species, their national status and a definition of the terms used is available on the DSE web site. Species in bold type are also listed under the Flora & Fauna Guarantee Act 1988. These species cannot be taken or kept within Victoria without a written order, licence or permit issued by the Governor in Council.